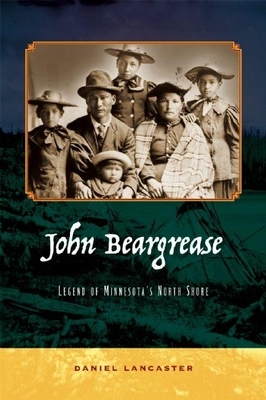 John Beargrease (1862-1910), the son of an Anishinabe chief, hauled the mail by dogsled between pioneer communities along Minnesota's tempestuous Lake Superior shore line. The annual John Beargrease Sled Dog Marathon is named in his honor.
. . . it was sometimes best to just keep going . . . pushing through three feet of snow, plowing over drifts six and seven feet deep, making their way among the boughs of the trees. Daniel Lancaster follows the legendary Beargrease through the settlement and development of the North Shore on his difficult traverse from traditional Anishinabe life to the modern world. Rich in history, mythology, and local legend, this is an engrossing read for anyone who has ever fallen in love with Lake Superior's wave-washed shores and snowy winters. Daniel Lancaster studied literature and creative writing at Southwest State University in Marshall, Minnesota, and completed a BA in literature at Metropolitan State University in Saint Paul, Minnesota, where he lives. He has been a contributor to various publications and periodicals in the fields of religious studies, early Christianity, and Judaism. Daniel Lancaster, a native of the prairies of southwest Minnesota, grew up in the news office of the Cottonwood Current, his father's newspaper in Cottonwood, MN. In the late 1970s he fell under the spell of Minnesota's North Shore while spending time with an older brother who was stationed at the US Airbase in Finland, MN.